Well, that was my case recently at "Chez Julien" recently, one of the smaller ships in the fleet of the very active Costes family. I sat with the menu in front of me, not knowing what to order, and what I finally ordered I wasn't keen on. Perhaps it was just me, but perhaps the cook isn’t great either. "Chez Julien" is one of these public spots I’d call a boutique restaurant which means it is nice, cosy and original, has that antique feeling with a contemporary twist, the interiors are either Starck or Starckesque and the service staff look like they just stepped off the fashion show catwalks. Put these ingredients together and you have the recipe for the success of the Costes family. 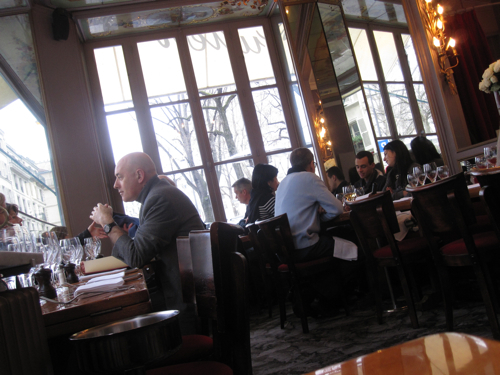 They bought "Chez Julien" a couple of years ago and they run, own or co-finance some 40 other hotels, brasseries and restaurants all over Paris, including the "Georges" in Centre Pompidou, hotels "Marly" and "Costes", "Café Beaubourg" and lots of others. Imagine them as something like the Cartwright family (from "Bonanza", remember?) when it comes to dining and sleeping in Paris. I’m sure they want to offer unique dining experiences at reasonable prices in fashionable surroundings but there’s a problem with the concept: it’s more about ambiance than food, more about design than cooking and everything is over-priced. The dishes you get at most Costes’ places, and "Chez Julien" is no exception, are just ok, they’re rarely good and never great. What is great though, at all Costes places, is the setting. 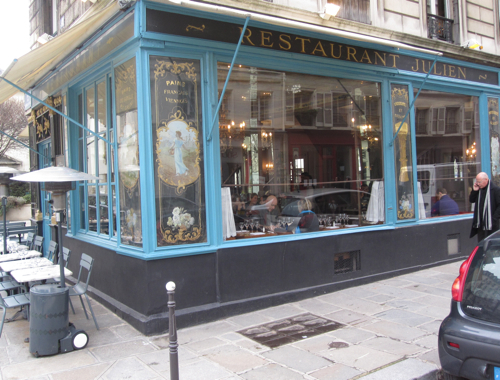 "Chez Julien" is a cosy, charmingly furnished bistro offering spectacular Parisian views at the same time. The restaurant first opened in the 18th century so you’re invited to walk the paths of history, close to the banks of the Seine with Notre-Dame only a stone’s throw away. So, in other words, it’s up to you: Do you want to have something to eat in a lovely place and are you ready to pay for it? Step in then. Are you looking for great food? Find yourself somewhere else.